With more to them than leaves for silkworms, the Mulberry Tree also provides the home gardener to one of the tastiest fruits available. These are a large tree, slow growing after the initial growth spurt, and very long lived. Dwarf types are becoming available and are perhaps best suited to to most suburban back yards. These trees provide us with a delicious berry, for eating or jam, and you really do need to grow your own for one simple reason. Mulberries are not readily available in fruit shops or markets as they are difficult to transport. The trees themselves develop an interesting gnarled appearance over time, they do look great in a open space where the crown can be allowed to spread and the trunk becomes a feature. Growing your own Mulberries is the alternative with black, red and white varieties being available for sale. In Australia a number of varieties are available for sale. ‘Hicks Fancy’ may be the tree of your childhood, it has been around a while and is large growing, masses of fruit and is an early ripening variety. The ‘Black English’ produces sweeter fruit and it later to ripen, excellent for cooler climates. ‘Beenleigh Black’ is a versatile tree, grows well in warmer climates and like most Mulberry trees is regarded as drought tolerant. ‘Wellington’ is a sought after heavy cropping cultivar. Morus macroura ‘Shatoot’ produces white to pale yellow fruit, very sweet. 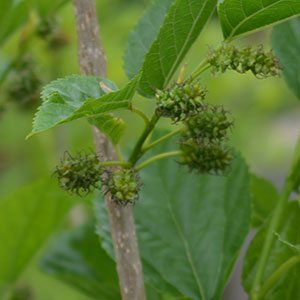 Morus rubra, or the Red Mulberry is native to North America. The well known Black Mulberry (Morus nigra) and the lesser known White Mulberry (Morus Alba) are also the trees that silkworms like. Mulberry trees are easy to grow and once established crop heavily. Dwarf varieties are available which are well suited to growing in containers. Full size trees will need at least 5m, however they can be pruned back after fruiting. Full sun and some good compost each year will keep the trees happy. Water well for the first few years until a good root system is established. After this they need little extra care. Although Mulberry trees make an excellent shade tree, they can also be pruned back each year to maintain a good size for fruiting. This makes it also a little easier to net the trees to keep the birds away. Pruning is carried out during dormancy, late autumn. Remember that these are a tree that fruit on new growth, so pruning will not harm the crop.